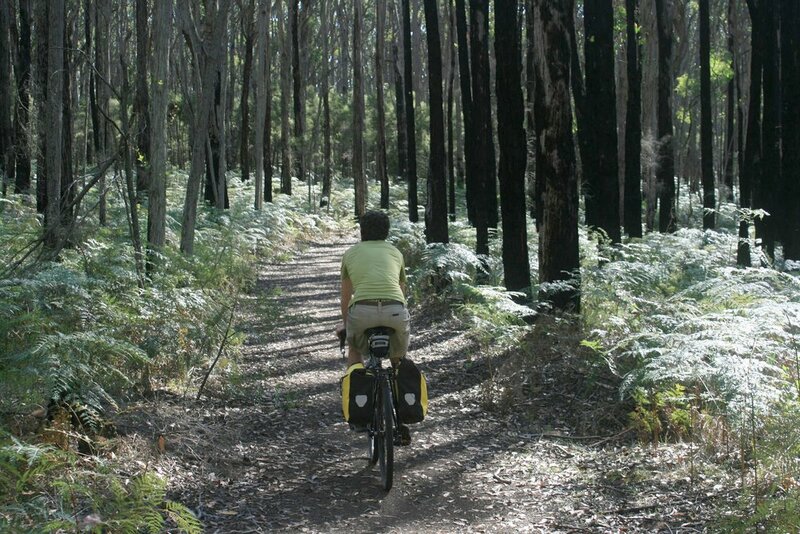 Adventure Cycling Victoria is a guide to the best bikepacking and bicycle-touring routes in Victoria, Australia. It was started in 2016 by Peter Foot (that's me), a Melbourne local, bike shop employee and part-time writer (click here for some of my writing). Over time I hope to make it the most comprehensive guide out there to touring in Victoria. THERE ARE OTHER RIDE-GUIDES OUT THERE, HOW IS THIS ONE DIFFERENT? ACV includes many different types of rides, and riding. It's not solely dedicated to road cycling, or rail trails, or mountain biking, but includes all of these and more. The rides traverse sealed roads, gravel roads, rail trails, fire trails, or a mix of these in one ride. What matters isn't so much the type of road or trail, but the adventure that's to be had on it. ACV is built around the weekend. Many of us would like unlimited time and money to cycle around the place in a leisurely and indefinite manner, but the reality is that most of us have to work, which means fitting recreational activities into that tiny crack in the space-time continuum known as the weekend. As such, most of the rides on ACV can be done in a 2-3 day period. There are, however, a handful of longer rides as well for when you have more time. The rides on ACV don't consist of just some nice road or trail that begins at one random point and ends at another. They are planned to be easily accessible by public transport (particularly rail), with the start and the finish usually close to a train station. ACV considers not just the ride, but the whole trip. There are rides and roads on ACV that you've probably never heard of. While it's definitely worth including some of Victoria's famous rides such as the Great Ocean Road or the Great Alpine Road, ACV aims to shine a light on some of the lesser-known but fantastic rides in Victoria. Which brings me to my next point. The motivation behind this website is as old as humanity itself. It is curiosity. When I'm out riding and I see a road branching off and disappearing around a bend, I'm gripped by an almost irresistible desire to go and see what's down there. I just want to know what's around that corner, over that crest, across that creek. When I'm walking around the city I get sucked into laneways and back streets like it's a law of nature, just to have a look. When I'm looking at a map and I see a road I haven't been down, a little red line wandering beguilingly across the paper, I just want to know what it's like to ride it. I love maps. Yes, the old fashioned paper ones that take up half a room. I love the way they give you an overview, an idea of where everything is without having to scroll around and zoom in and out. I love how you can pick a road and trace it with your finger from one edge to the other, see it in its entirety, see how it connects to everything else. So many times I have picked a road at random and gone out and ridden it, and so many times I've been amazed at just how lovely or spectacular or interesting they are, and how little I knew about it before, despite it being in my home state. And almost every time I'm amazed at how few people cycle these roads. I am not a cyclist so much as an explorer. I'm aware that this sounds like an incredibly presumptuous statement; the golden age of exploration is over. There are no more Columbus's or Marco Polo's sailing into the unknown, no more Burke and Wills's traipsing through the vast, unexplored interior. And not for a second do I wish to compare myself to those intrepid souls. But when I pick a line on a map, when I experience a place for the first time, when I chat to the publican, have a beer with a local, wade through a river, climb over a saddle, camp in someone's backyard, damn it I'm exploring! Exploration is what excites me and motivates me the most. Exploration doesn't have to be grand and perilous and far-away. It can be in your own backyard. It can be low-key. All you need is a desire to get to know your world a little better. All you need is curiosity.